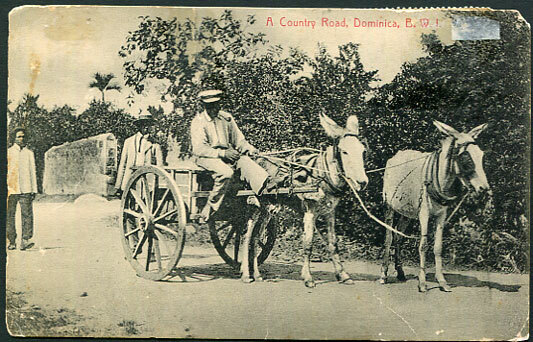 1947 b/w ppc of "A Country Road, Dominica" with Dominica KG6 1½d affixed for Chula Vista, California, carried privately to Martinique with pair 3fr on 2fr added and tied FORT DE FRANCE */15 4 47 cds. 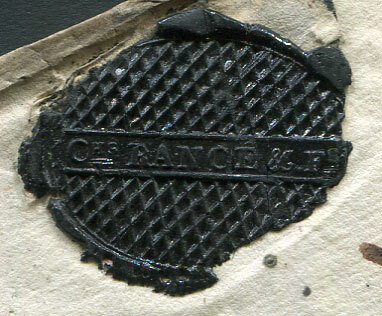 Closed tear to card at top but a most unusual combination. 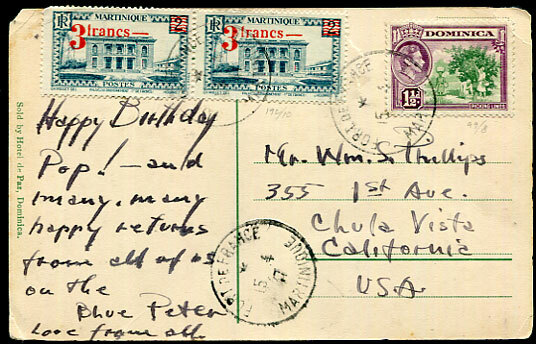 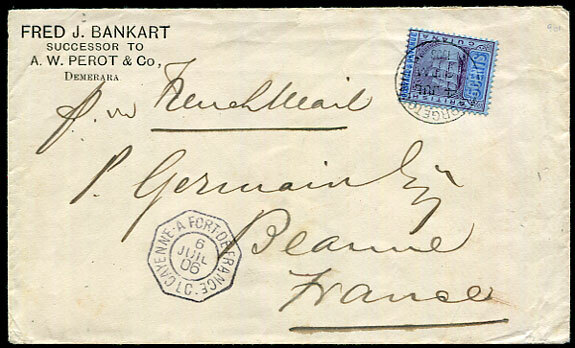 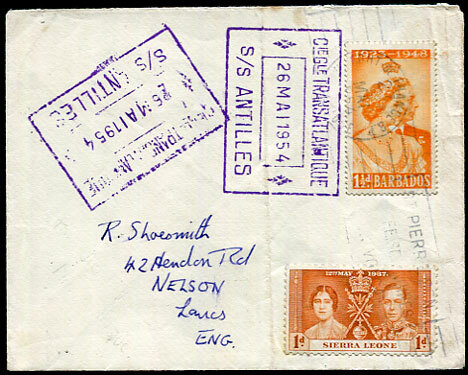 1954 unusual combination and out of period use cover to Nelson, Lancashire with Sierra Leone 1937 KG6 1d Coronation coupled with Barbados 1948 KG6 1½d RSW tied FORT-DE-FRANCE 27 MAI 1954 machine slogan with purple strikes boxed "CIE GLE TRANSATLANTIQUE/26 MAI 1954/ S/S ANTILLES" handstamps, no backstamps. 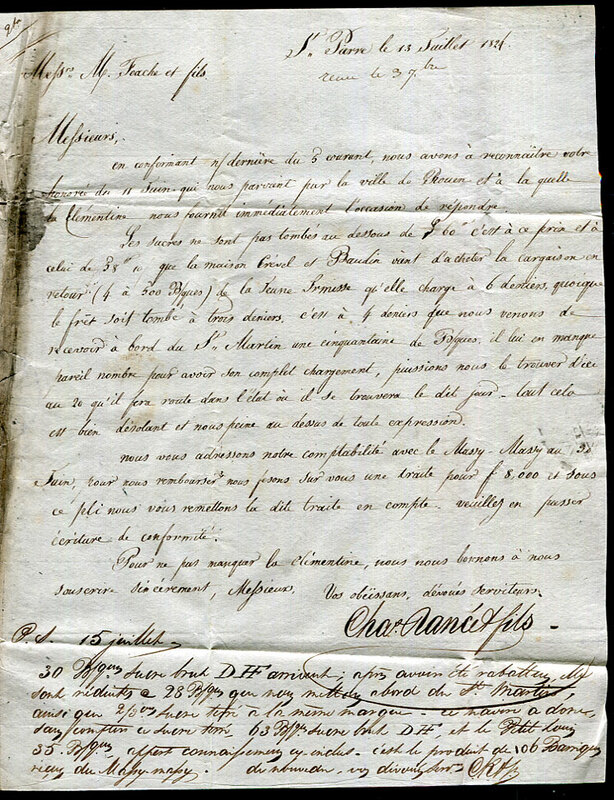 1824 entire headed "St. Pierre le 13 Juillet 1824" carried by private ship "Papillon" to Havre, France with str. 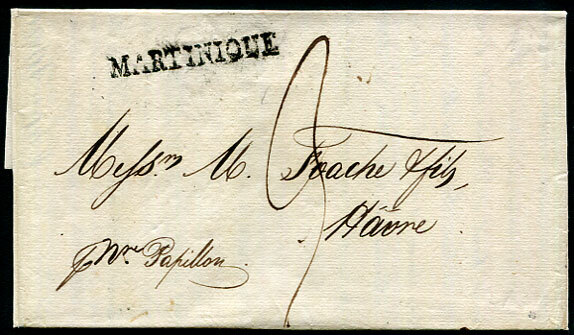 line MARTINIQUE. 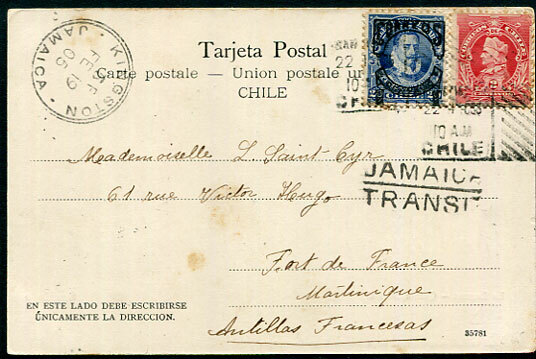 1906 b/w ppc of La Laguna, Santiago with text at base to Fort de France, Martinique with 2c, 20c pmk'd 22 1 05 with JAMAICA/TRANSIT ("A" below last leg of "M") and Kingston 5F/FE 19 05 transit alongside, some blemishes.